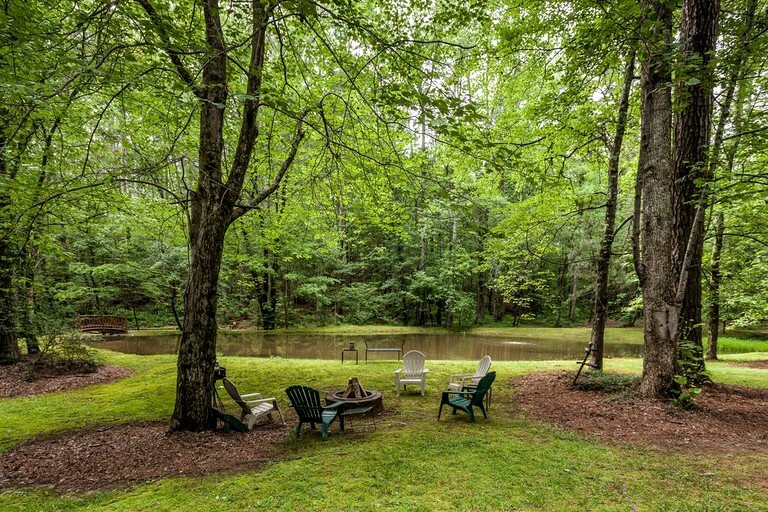 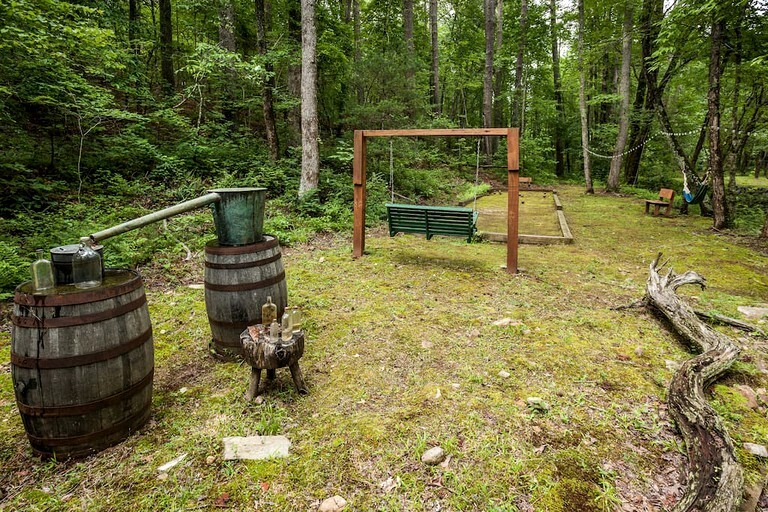 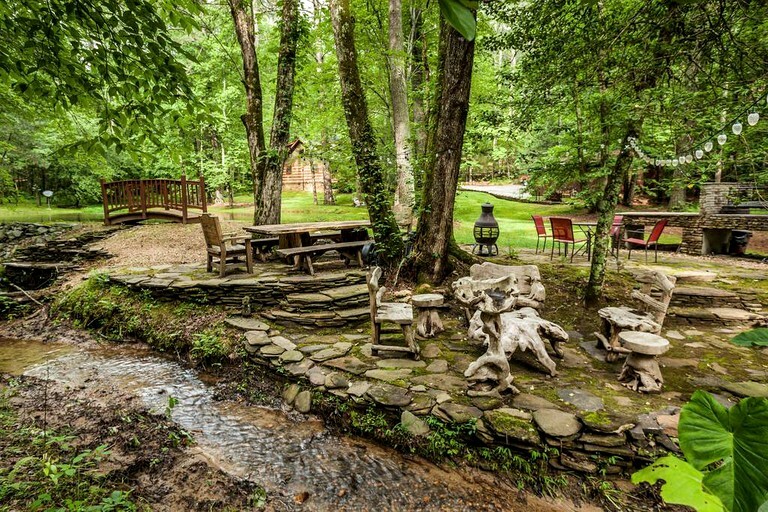 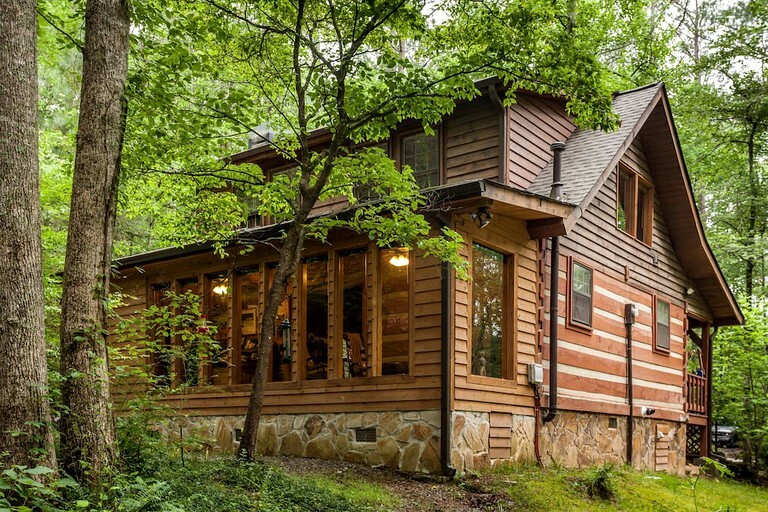 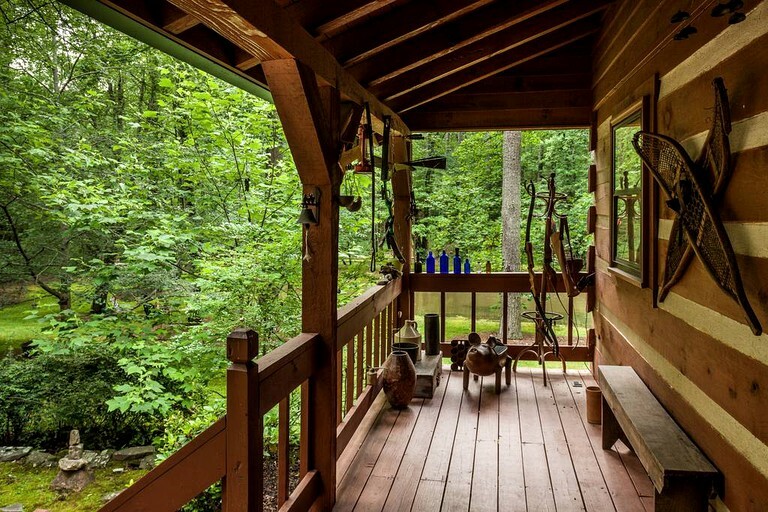 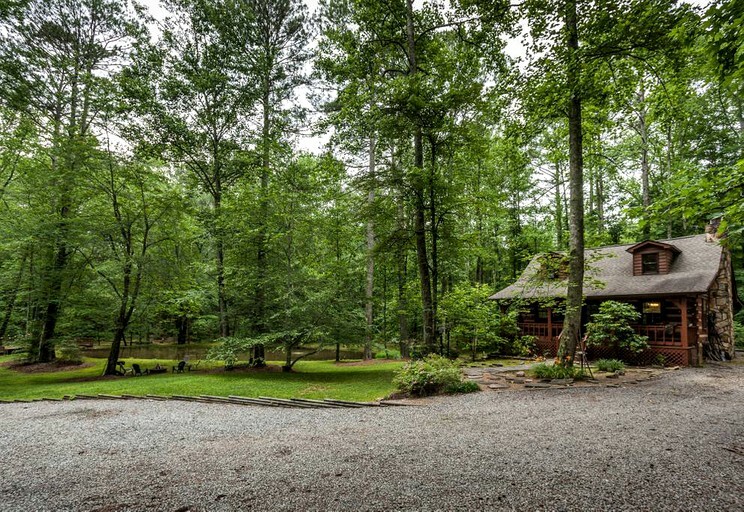 This charming cabin rental with a gorgeous koi pond is located near Carters Lake, Georgia, and is the ideal retreat for four guests looking to reconnect with nature! 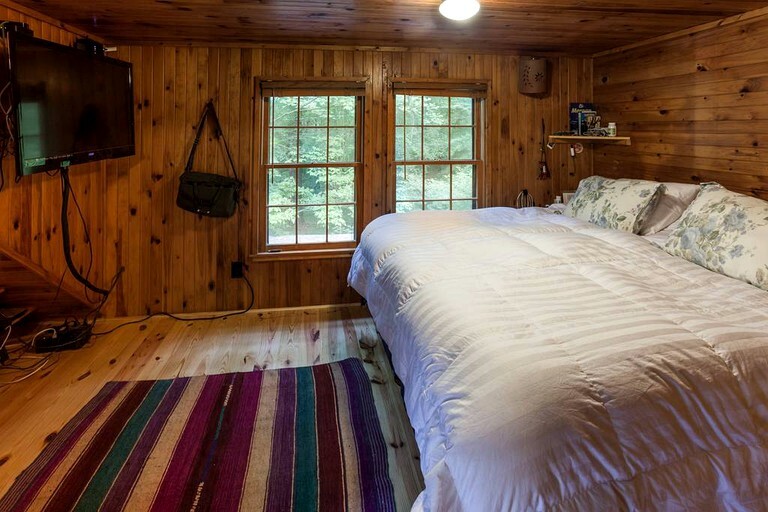 The cozy cabin is adorned with decor from all around the world and guests will have two beautifully decorated bedrooms which both come with plush queen-size beds. 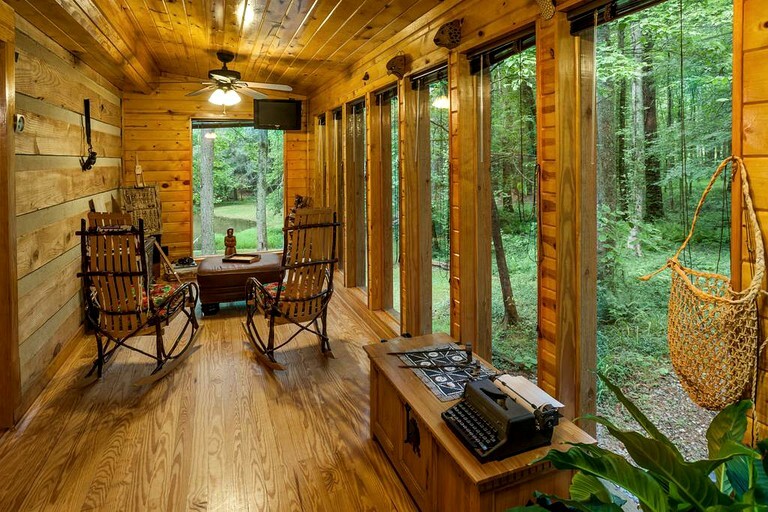 One of the bedrooms has a huge flat-screen TV while the other boasts a comfy sofa with great woodland views from the window. 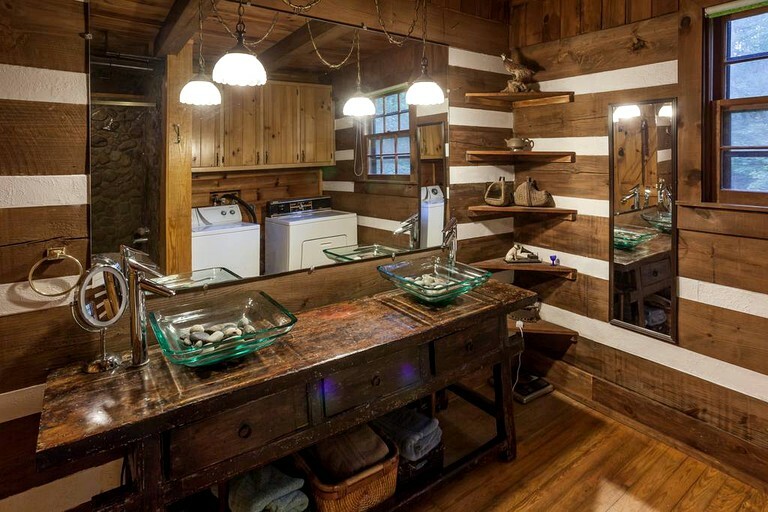 The bathroom is equally as impressive with its rustic sinks and luxurious bathtub, and linens and towels are kindly provided by the hosts. 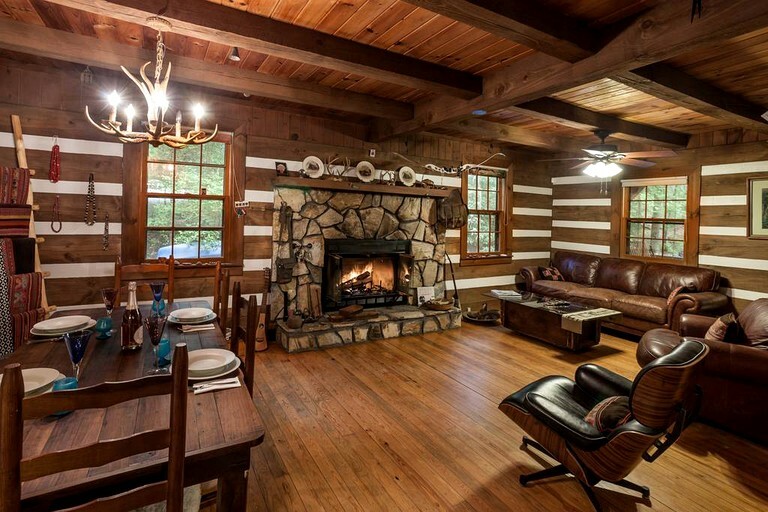 Guests will love the spacious living room which comes with a roaring stone-clad fireplace, comfy sofas and seating, a cozy dining table, and lovely wooden floors. 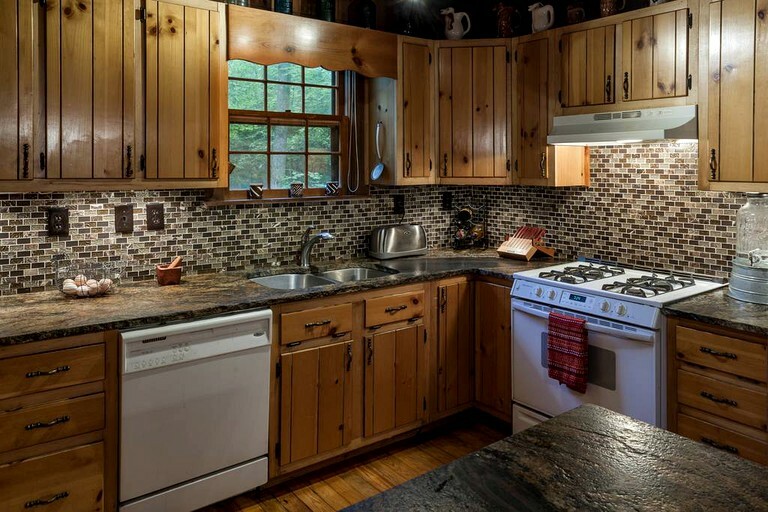 The fully-equipped kitchen comes with all the amenities and appliances guests will need to cook up some tasty meals including a stove, an oven, a toaster, a microwave, and all the necessary dishes and silverware. 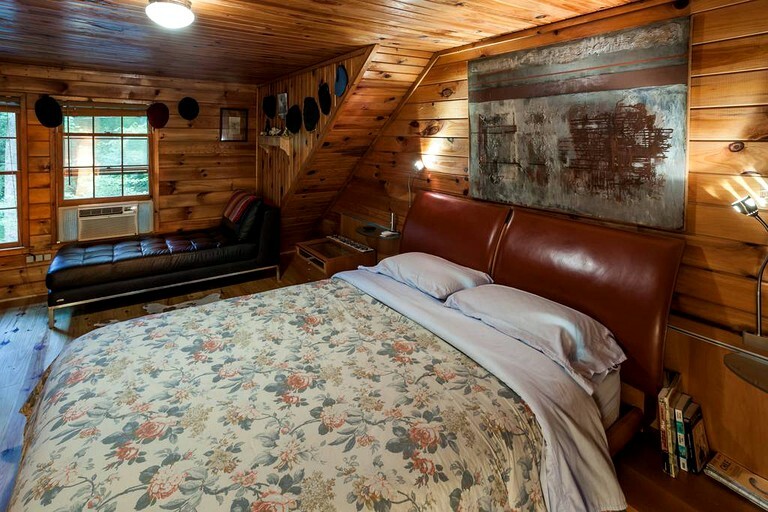 Other amenities include free parking, Wi-Fi, heating, and air-conditioning. 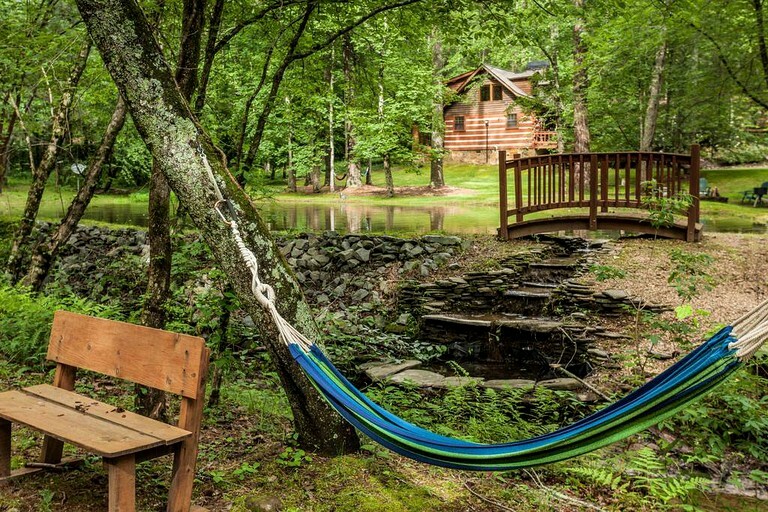 Guests will have all the amenities they need to enjoy a peaceful and comfortable stay immersed in nature! 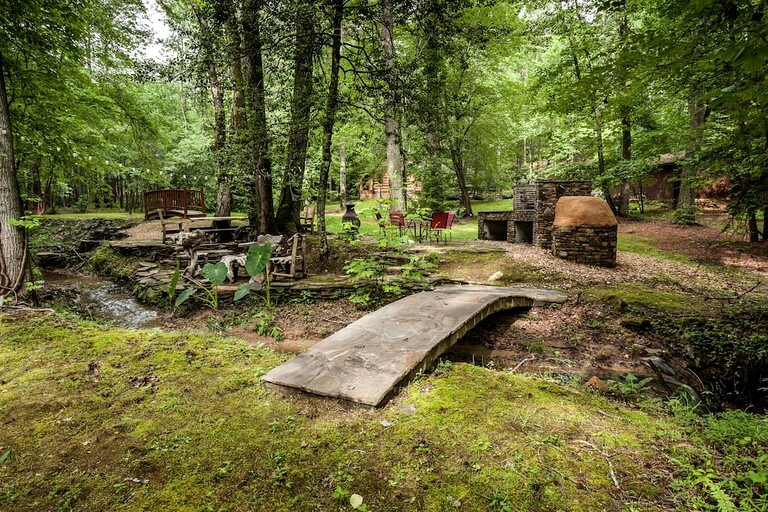 Guests will have a full kitchen which comes with everything glampers could need to cook up a storm while the comfy living area comes with plush seating, a stone-clad fireplace, a lovely dining table, and impressive wood paneled floors. 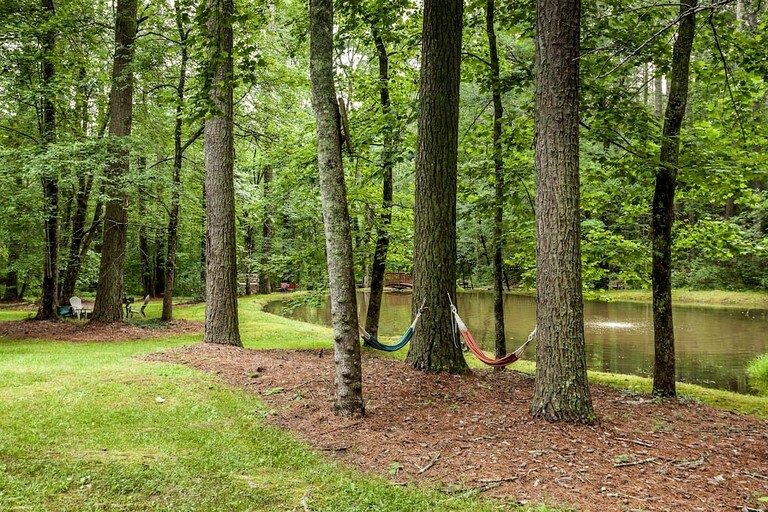 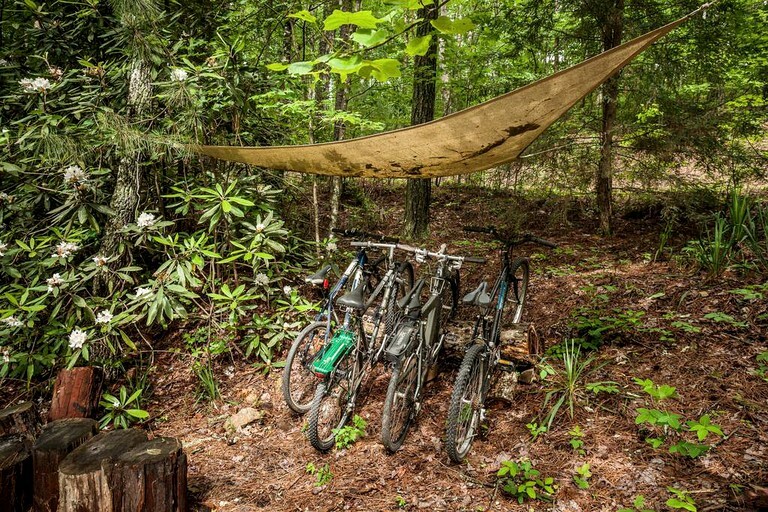 Other amenities include free parking, Wi-Fi, heating, air-conditioning, and hammocks. 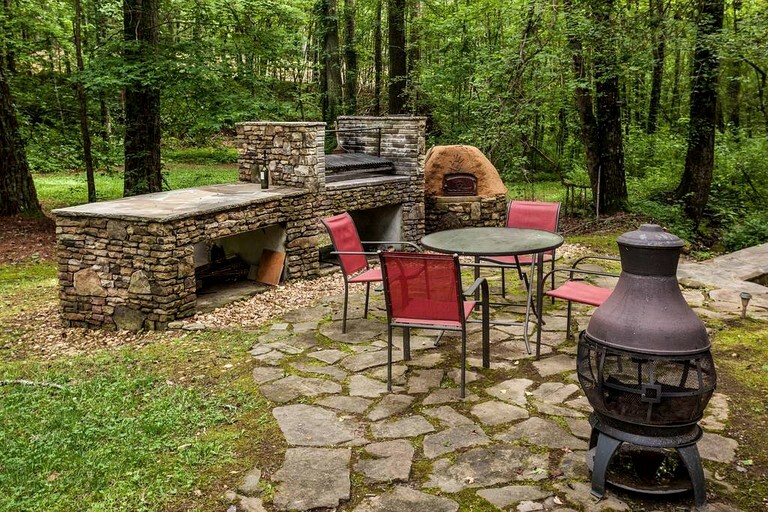 Outside, guests will find a gorgeous patio area with a BBQ grill which makes a great place to cook up some tasty burgers while admiring the wilderness surrounding the getaway. 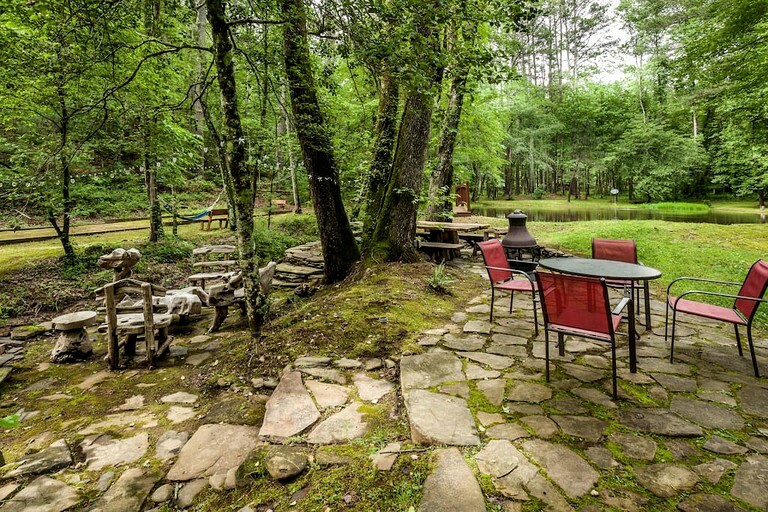 Guests can even feed the koi in the lovely pond! 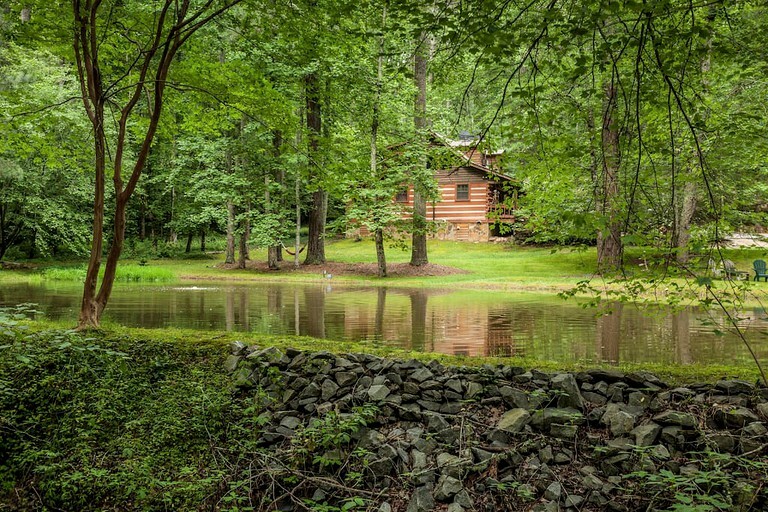 Guests will be greeted with a tour of the property and the hosts are able to answer any questions guests may have. 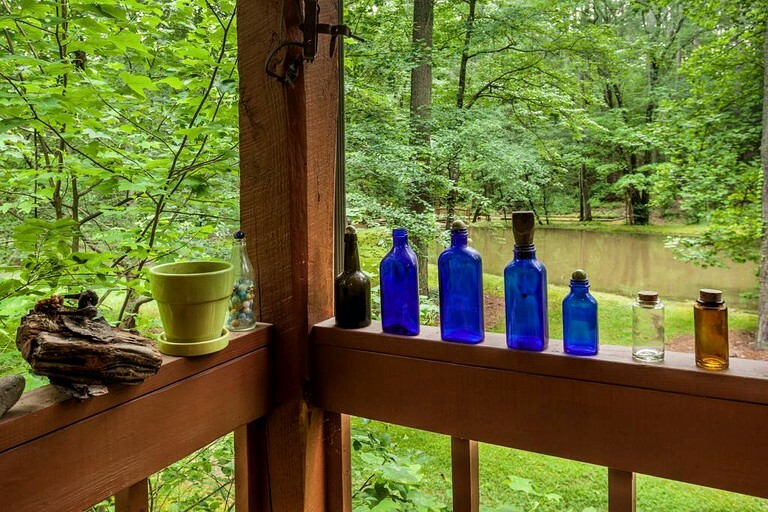 In the event that the hosts are not available when guests arrive, lockbox information will be shared prior. 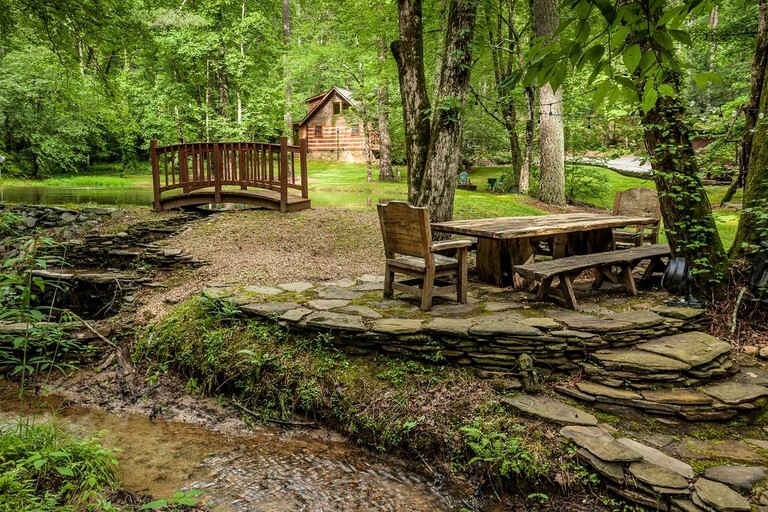 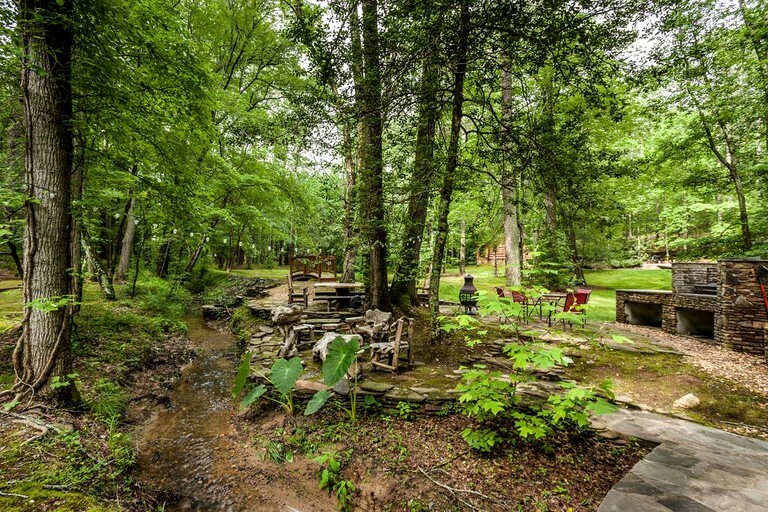 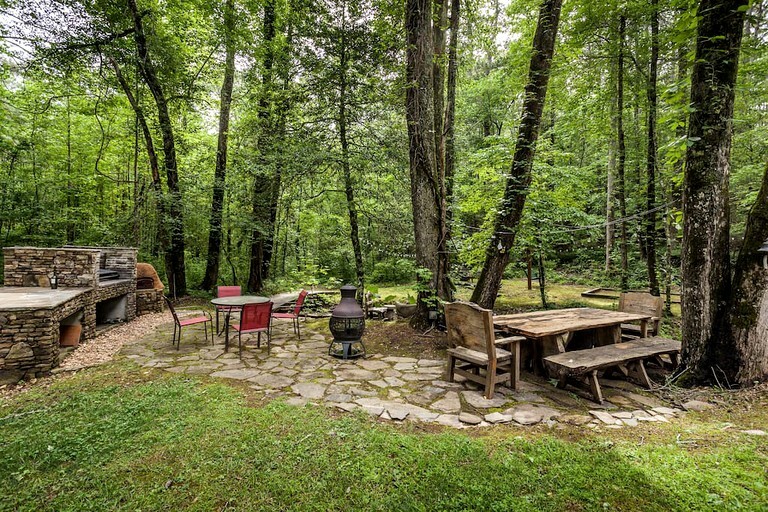 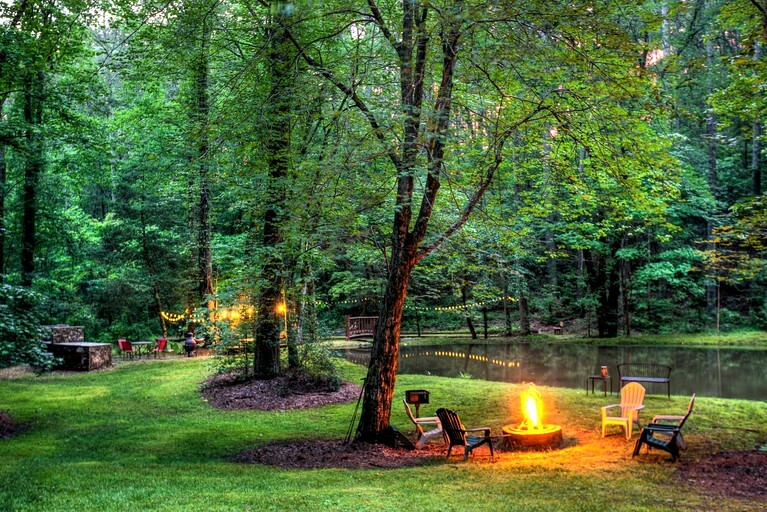 Ideally located in the majestic Appalachian Mountains, this charming property is perfectly secluded on 15 acres of pristine woodland and offers guests the chance to take a much-needed break from the hustle and bustle of city life by being surrounded by the serene sights and sounds of nature. 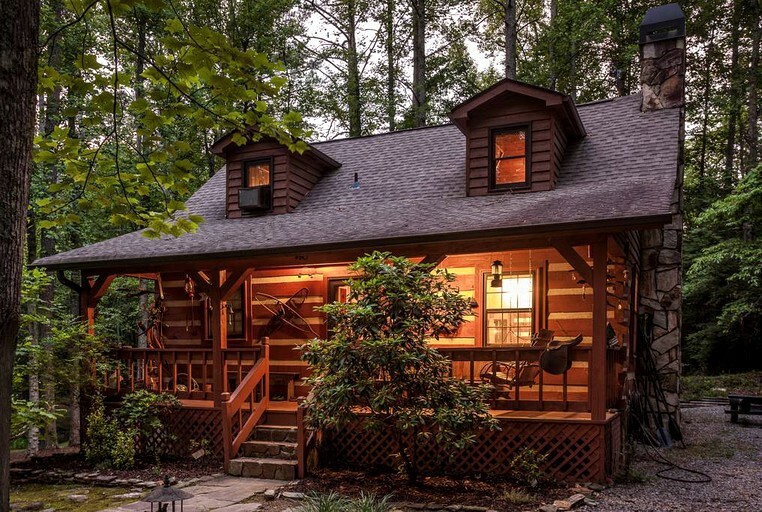 The cabin is conveniently located just 90 minutes from Atlanta and with Carters Lake just a short drive away, guests will be spoilt for choice when it comes to the thrilling outdoor activities on offer in this gorgeous area of the world! 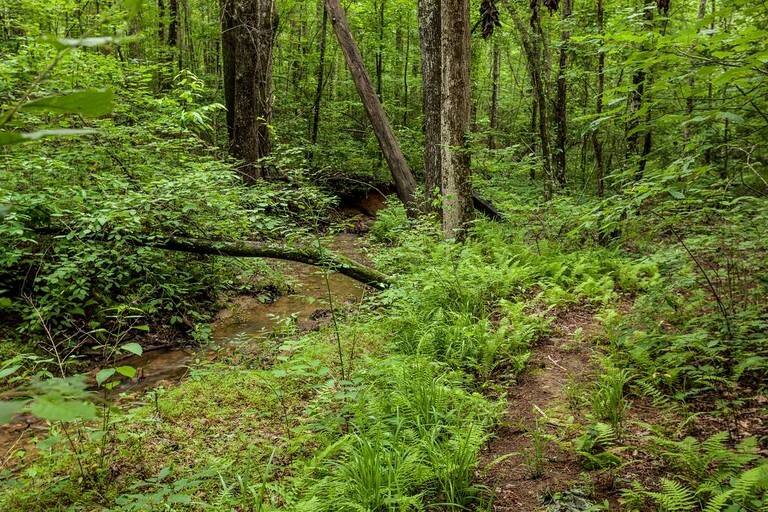 Visitors to this area will be in the ideal spot to take advantage of stunning environments for a variety of outdoor activities. 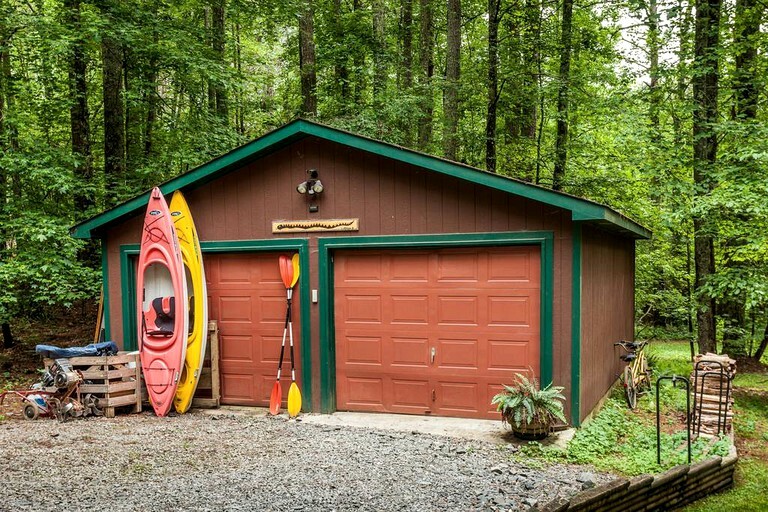 Carters Lake is a haven for outdoor enthusiasts and the pristine waters offer fantastic recreational opportunities for water sports and guests are strongly encouraged to explore the region by kayaking, canoeing, paddleboarding, and swimming. 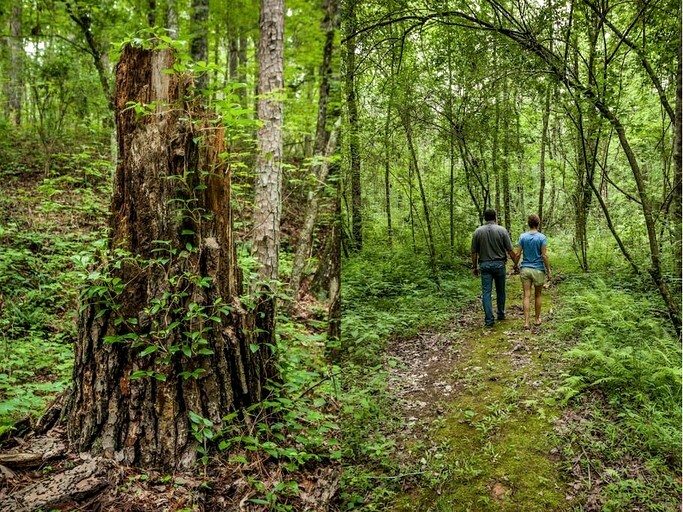 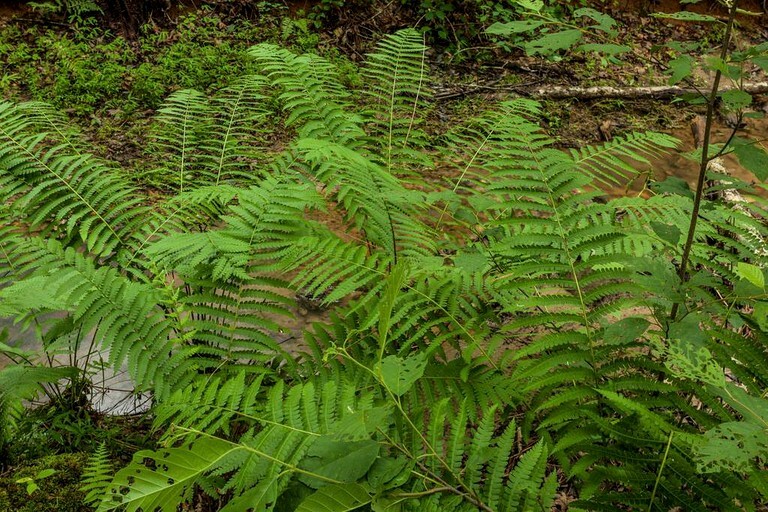 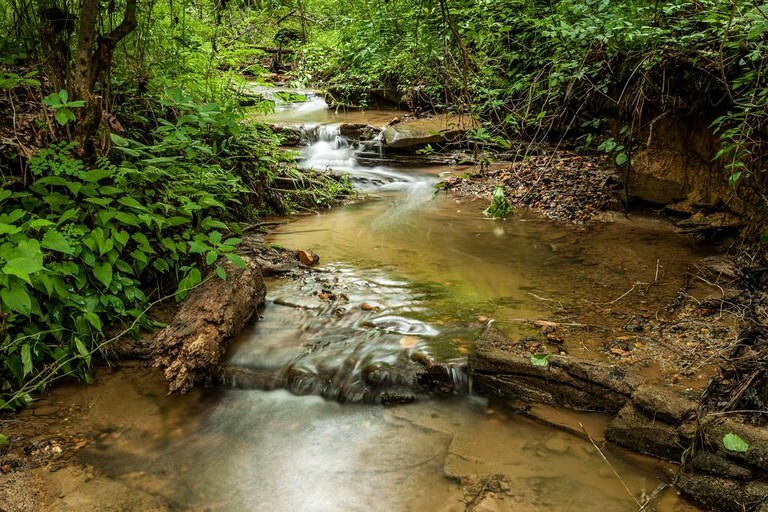 Hikers and bikers will also be in their element at Carters Lake as there are several enchanting trails just waiting to be discovered. 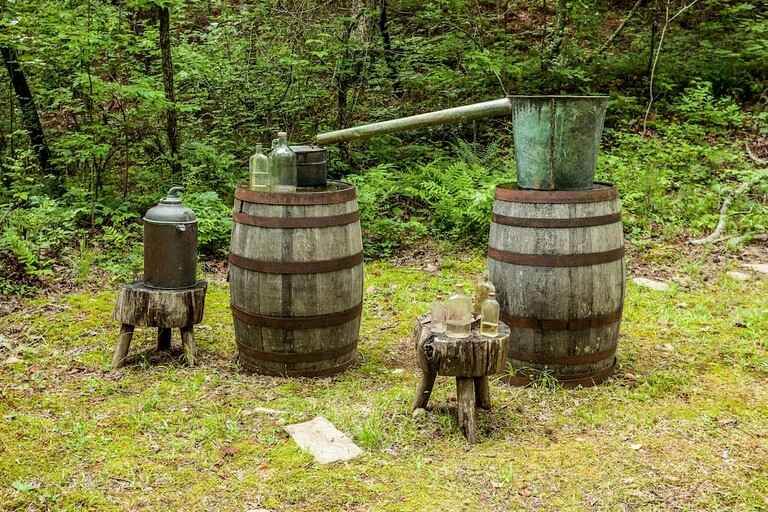 Guests looking to soak up some Georgian culture can make the trip to nearby downtown Ellijay where guests can dine at delectable restaurants, shop at the charming stores, pick up a hidden gem in an antique store, or even spend the day at the famed Apple Festival!